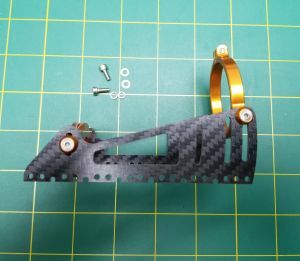 New Carbon fiber, heavy duty motor mount for 40mm motors. 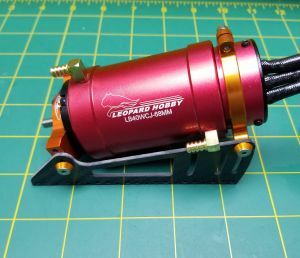 Example, TP 40xx, Leopard 4074, 4082 and 4092 brushless Motors. Fits 40mm diameter motors that are 60mm or longer in length. Rear motor clamp helps carry the weight of the heavier/longer 40mm motors. Angle is adjustable to allow straight alignment with propeller cable. The anodized aluminum mounting plate with extended Carbon fiber mounting stands to distribute the weight of the motor over a larger area for added strength. The mounting plates that have holes drilled in the bottom to allow epoxy to flow into them to make a superior bond to the hull. This mount can will fit a vee bottom or similar hull. It will require modifying to fit a flat mounting area like a rigger or hydro. 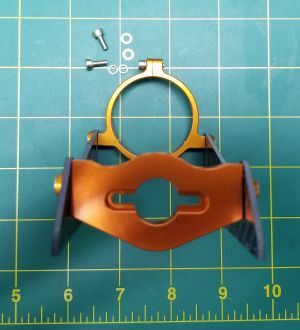 Upto 50mm long water jacket can be used with 74mm & 82mm long motors. Upto 68mm long water jacket can be used with 92mm long motors.